Beach Home with easy beach access! "Bare Feet" is a home featuring top of the line amenities and a peaceful escape from reality. Located on the West End of Panama City Beach, this home offers access to the most beautiful beaches in the world! With spectacular views of the Gulf of Mexico, this 3,250 square feet beach house will sleep up to 20 guests. Conveniently located on the tranquil West End, yet within only 5 miles of the bustling Pier Park, "Bare Feet" is a prime location for night life, yet still provides peace and quiet for a family escape!! Guests will enjoy many amenities that make each beach vacation unforgettable. Relax by the private pool, cook up a feast on the commercial Kamado grill, or watch the sun fade away from one of 3 private decks. Bare Feet spared no expense when it comes to a 5-star experience. The beautiful white sands and the Gulf of Mexico is a spectacular sight. Guests can enjoy the luxury of the pool, and grill without compromising the remarkable views of the Emerald Coast. Wi-Fi is provided throughout the home, as well as Cable TV. Bare Feet also provides a memorable escape with its impressive outdoor living space. 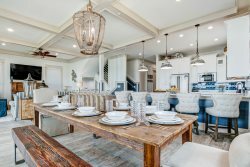 You can soak in the private pool, cook a feast for the family on the outdoor grill while relaxing on the chairs overlooking the Emerald Coast. Bare Feet has everything you need to make your beach vacation unforgettable. As you enter the home you will see a living area with a couch, table and stools, and flat screen TV. Down the hall is a full bathroom with a walk-in shower and a bedroom. The bedroom features to full size beds with twin bunks above them, personal reading lights on each bed, and a flat screen TV. There is also a side door near the entrance that leads straight to the yard, pool, and grill area. Head up the stairs to the second floor and you’ll notice the great open floor plan. There is a fully stocked kitchen with stainless steel appliances and bar seating for seven. The large dining room table can seat up to 12 guests, perfect for gathering the group for dinner. The cozy living room is just to the side of the dining area and features comfy seating, a flat screen tv, and direct access to the second-floor deck. Enjoy the open space by opening the sliding glass doors and relaxing while lounging outside and catching a glimpse of the beautiful Panama City Beach. Down the hall you’ll find a half bathroom, larger washer and dryer laundry area, and a queen-sized bedroom with connected bathroom and walk-in shower. Take the stairs to the top floor where you can relax in the common area, which has a futon couch and flat screen TV. Directly to the right of the stairs is the queen over king bunk bed room with connected bathroom and flat screen TV. Across the hall is another queen size bedroom with en-suite and a flat screen TV. At the south end of the home are the two king master suites. Each room as a double vanity in the bathroom, a flat screen TV, and best of all, direct access to a furnished balcony. The sliding glass doors will lead guests to relaxation while taking in the sun and watching the waves across the street. Need two homes to accommodate your group? Look at Sandy Toes and Salty Kisses. By the 2 nd night we decided that we would return next year so we called and booked. We were 6 couples and believe me everyone had a fantastic time and thought the house was excellent. There was obviously a lot of thought and planning that went into the design and building of this house. Its conveniently and strategically located directly across from the public beach access which gives you amazing views of the gulf beach from the second floor balcony and both master bedrooms on the third floor. The furnishings were high end from the beds to the fixtures in the baths. It had a huge kitchen with an open floor plan to the dining area and great room. The outside pool area and deck were private from the other houses. The carport was massive...big enough to get 2 cars under...or in our case, 5 motorcycles. Plenty of additional parking in the driveway. We had a party of 10 and everyone commented on how great the house was. Hope to be back next year! Great space, great location, great view. It would be difficult to find a better spot for a large family. We really enjoyed our time at Barefeet. The house is beautiful and very tastefully decorated. The beach on this end is much quieter than the east end, which is very nice, yet youre still very close to all of the shops and restaurants. We did not want to leave at all! We will definitely be staying here again!